AudioLinux is based on realtime custom kernels and on the work of that part of linux community trying to achieve very low audio and processor latencies. 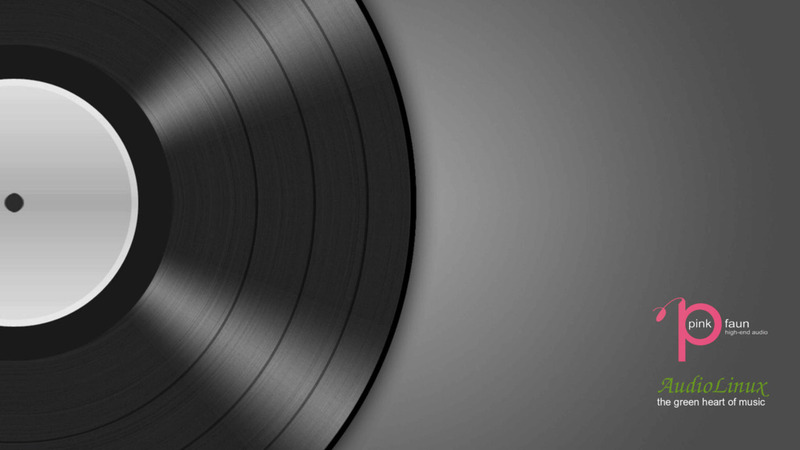 The results are not audiophile subjective suggestions, but real and measurable. 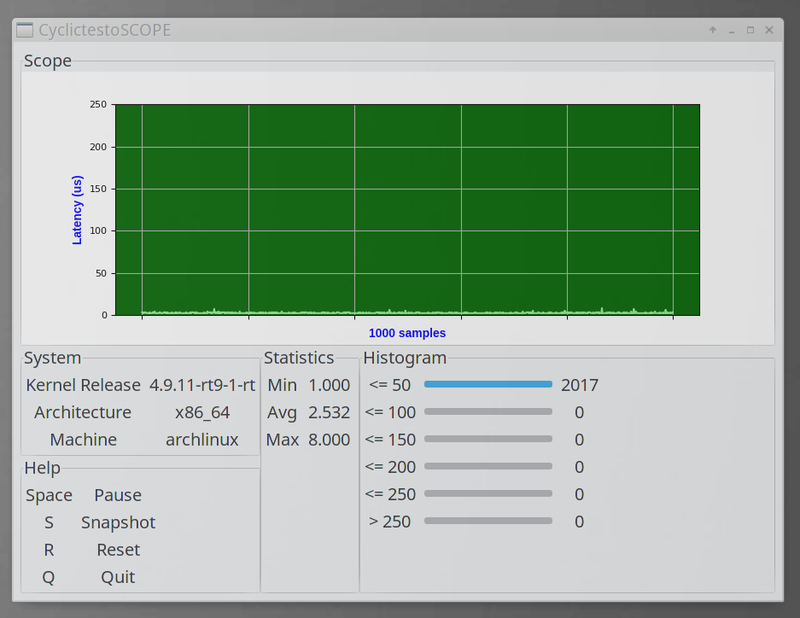 You can make a processor latency test yourself clicking on the oscilloscope test inside Realtime Priority folder on the Desktop. No magic hidden code, but only the magic of music. AudioLinux can be used in Audio Pro studio recording because of stability and freedom from glitches. With a powerful CPU is perfect for extreme upsampling (up to DSD 512 or PCM 768 kHz). What about the sound? Clean, transparent, the last veil is removed... and a quick and complete support that no one is giving in Linux. Your system will be fine-tuned for the absolute best performance. *** If you have one image and you want another. For example if you already have lxqt and you want headless. 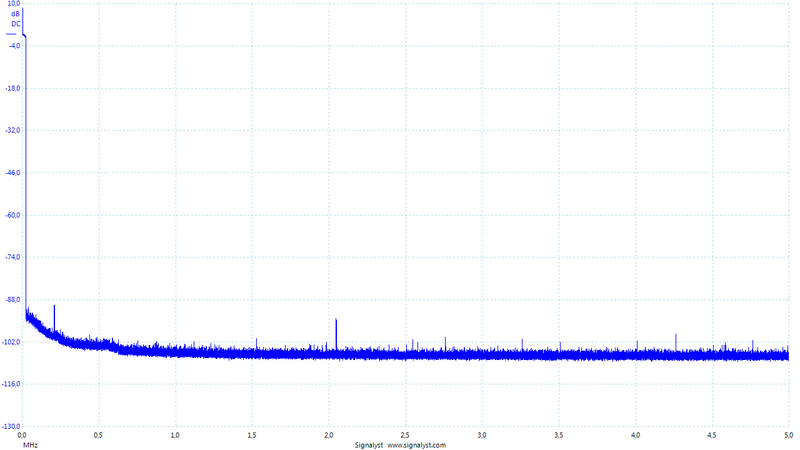 Audio latency at 44.1 kHz < 1 ms depending on hardware configuration. Compatible audio applications: HQPlayer and HQPlayer embedded (with CUDA acceleration, if you install nvidia closed source drivers), HQPlayer Network Audio Daemon, MPD (with optional upmpdcli UPnP media renderer), Logitech Media Server + Squeezelite with C-3PO plugin, Kodi (XBMC), Jriver Media Center, Roon. Remote control with Unified Remote for smartphone. NoMachine server included for remote Desktop control. Now you can start headless without graphical Desktop and access audiolinux from smartphone or PC in a virtual Desktop identical to the default one with NoMachine! From version 1.9.7 you can load the entire system to RAM as an option. For this you need at least 16GB RAM (8 GB for AudioLinux headless). There is the option to save the entire system in "ram mode"
AudioLinux scripts and RTapp Copyright P. O. 2014-2018. AudioLinux image contains proprietary software. It cannot be copied without removing the corresponding software. 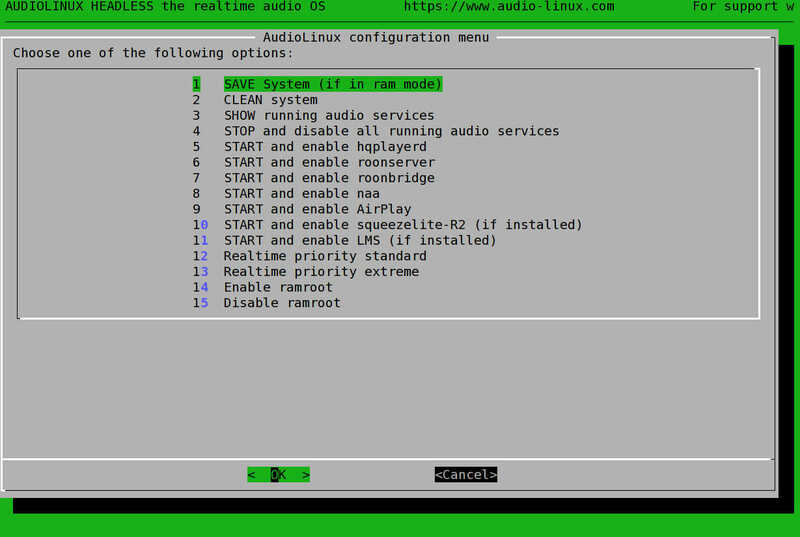 AudioLinux is not a separate Linux distribution but only a customized Archlinux image for audio. For all legal and copyright issues please refer to www.archlinux.org The payments reported above are for support, customization work, proprietary (non-GPL) software, usb stick, shipping. --> Support is complete for installation on USB stick or internal HD, but if you need help for a dual boot with Windows, because you are not a linux expert, a further payment of € 29 is necessary. I need a lot of time, a lot of emails to support a customer in this case. 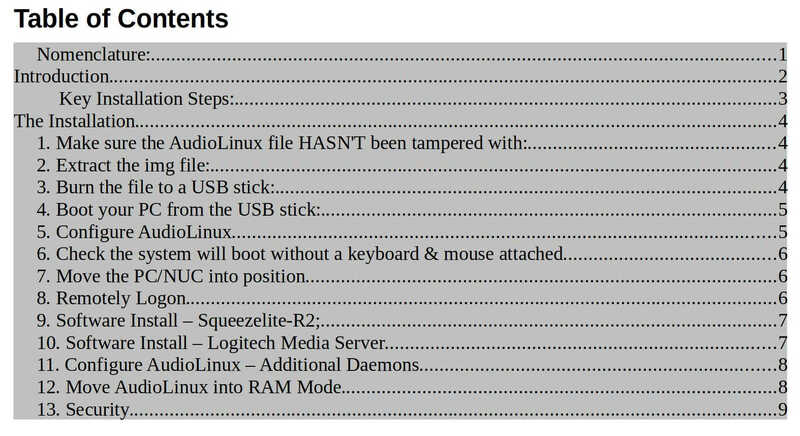 * For audiolinux lxqt please look inside the directory "Start here" on the Desktop and read all the... read-me files. * In audiolinux lxqt you can connect to graphical Desktop with NoMachine, if you install it in Windows, Linux, smartphone. With NoMachine remote Dektop you can start headless without graphical Desktop and access AudioLinux in a virtual Desktop identical to the default one. After your configuration is finished, you can switch back to headless with a simple logout. 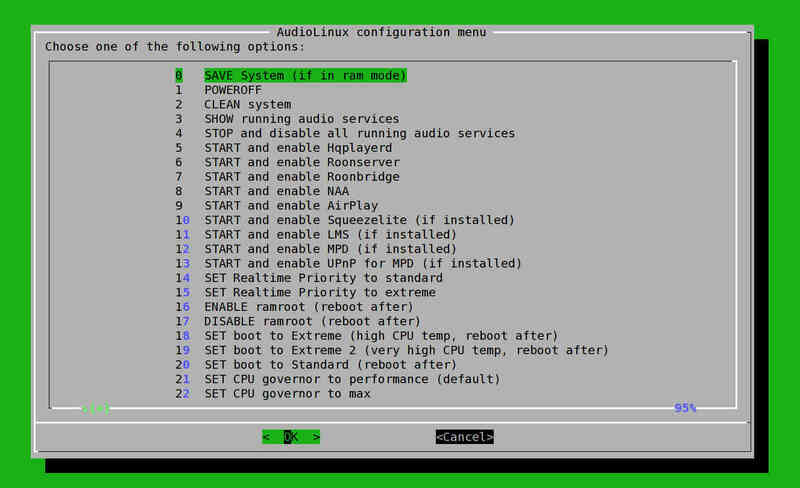 To enable it, start lxqt configuration, go to Session settings/Autostart and enable "Unified Remote"
Audiolinux headless 0.5 has an automatic configuration that will permit to connect immediately after booting the first time. However, for a more stable network configuration, follow the steps reported below. --> change Address, Gateway and DNS to your preferred values. * In audiolinux lxqt you can find some nice shortcuts for enabling/starting/disabling services inside Start here. MPD, LMS and squeezelite are already installed. In audiolinux headless Roon and HQPlayer embedded are already installed. You can stop or disable, changing start to stop and enable to disable. Default is 30 seconds, you can change this to a different value. Note 3: If you are using Roonbridge in more than one computer take into account that: "RoonBridge generates and writes out a unique id into its data directory on first run and uses that to identify itself to RoonServer. Clear out /var/roon on the second device (or hunt down and delete the RAATServer/Settings/unique_id file) and it will generate itself a new one next time it starts up." For system modification and system update we suggest to boot in normal mode answering N to ramroot boot prompt. Please note that these commands will install the application and many dependencies, so audiolinux size will increase and as a consequence boot time in ram mode. Installing new audiolinux realtime kernel. After nstall the new kernel with pacman -U followed by the names of the packages. *** If you are running in ram mode, reboot answering N at boot prompt to boot in normal mode. --> This is necessary for enabling CUDA acceleration in HQPlayer, if you have a nvidia card. --> If you will use ramroot later, leave some unallocated space on the hdd for an extra partition or add another drive, otherwise, if you copy the music files into audiolinux partition, the size will become too big for booting to ram. 7) Power off the PC, unplug previous external linux installation and boot from the new HD/USB stick. --> In this case you will miss step 6) of installation guide above. For a possible solution see this guide case 1) but installation with these applications is not recommended. This is the official how-to, You can use also other methods that allow the cloning of an image with multiple partitions. To auto-mount the hard disk at boot you need to edit the file /etc/fstab. You can also use pcmanfm-qt file explorer root (red icon on the bottom bar) and edit the file from there. I suggest to mount in a subfolder of /media where there are some folders with the right permissions already set. Don't mount outside of /media subfolders if you are using ramroot! Please be careful. If /etc/fstab has a wrong line, the sytem could not boot. Substitute mylabel, myuuid, servername, password etc. with your values. In Audiolinux realtime priority is assigned by 2 services: rtirq for irq priority and rtapp for application priority. In the default configuration it will give the defined priority to all usb devices. This is not a good choice if you have other USB equipment connected to your computer. In the examples that will follow we have 2 network interfaces, enp3s0 and enp4s0. Your names can be different. Roon Database can be huge. 1) Drive space is insufficient because you did not resize the ext4 partition after installation. 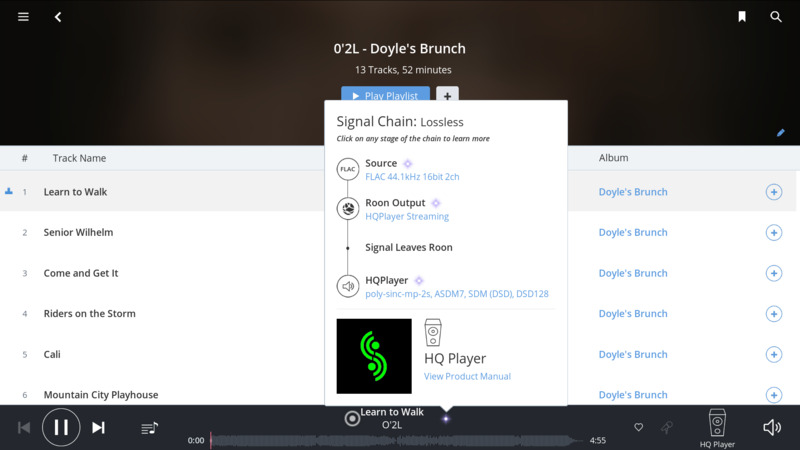 Tidal music streaming is already integrated in Roon, BubbleUPnP, LMS and Mconnect. Qobuz is available on BubbleUPnP, LMS and Mconnect. 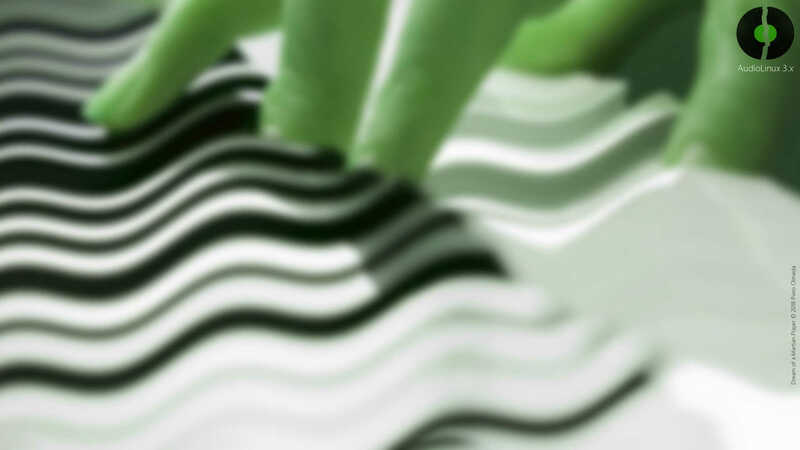 Spotify and Qobuz applications already installed (upsampling not possible). With NoMachine remote Dektop you can start headless without graphical Desktop and access AudioLinux from smartphone or PC in a virtual Desktop identical to the default one. After your configuration is finished, you can switch back to headless with a simple logout. 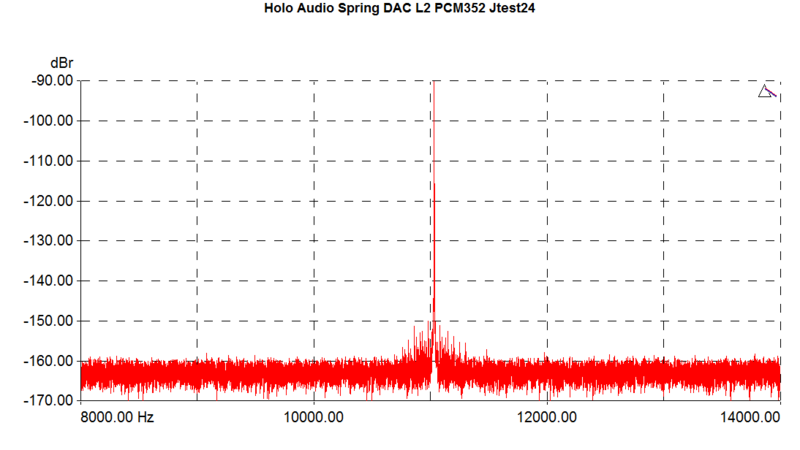 We have made some tests of the real performance of AudioLinux. Results upsampling with HQPlayer at the same time are not different! PinkFaun Streamer 2.16 Is probably the best computer for audio on the market. It can be delivered with a special version of Audiolinux. There is a discussion about it at Computer Audiophile Below some nice images from the same forum. Click for full size. Custom Fanless PC in a Streacom case, PinkFaun Streamer 3.4, custom USB to i2S interface, Holo Audio Spring Dac, SAC Minute transformer preamplifier, Ayon Sunfire SET tube amplifier, modified Audiostatic electrostatic speakers DCI A-sinus. 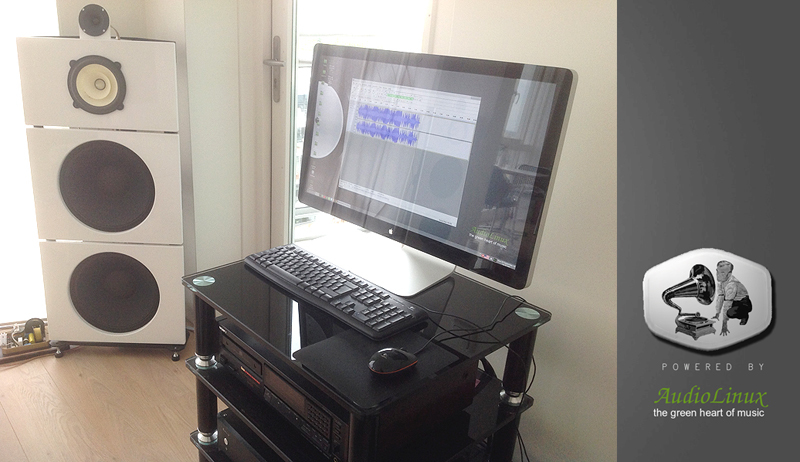 This system, with Focusrite mic preamplifier, is used also for audio recording/monitor. 14/04/2019 Menu 110 with new WiFi menu! 05/04/2019 Menu version 109 with new expert menu: "Minimize your system" "Realtime expert configuration" "Disable realtime expert configuration" "Alsa system wide configuration file"
29/03/2019 Menu version 108 with option 12 "MPD --> select DAC and play from memory"
23/03/2019 Menu version 107 with 2 important updates: 1) Format extra drive 2) New installation copy script with the option to choose the audiolinux partition size and make an extra partition for your music. Very useful if you want to install it in a bigger drive. 20/03/2019 Audiolinux headless release 1.1.1 with fix for new upmpdcli package and updated working pstate-frequency package. 12/03/2019 New Raspberry 64 bit image 0.6 with kernel 5.x Now with hqplayer embedded and naa! 06/03/2019 With the last menu 104 we are the first to offer the new Merging ALSA RAVENNA/AES67 Driver for Audio over IP! 05/03/2019 New version of audiolinux lxqt 3.2.0 with more than 240 updated packages and new look with the same menu system as in headless version. 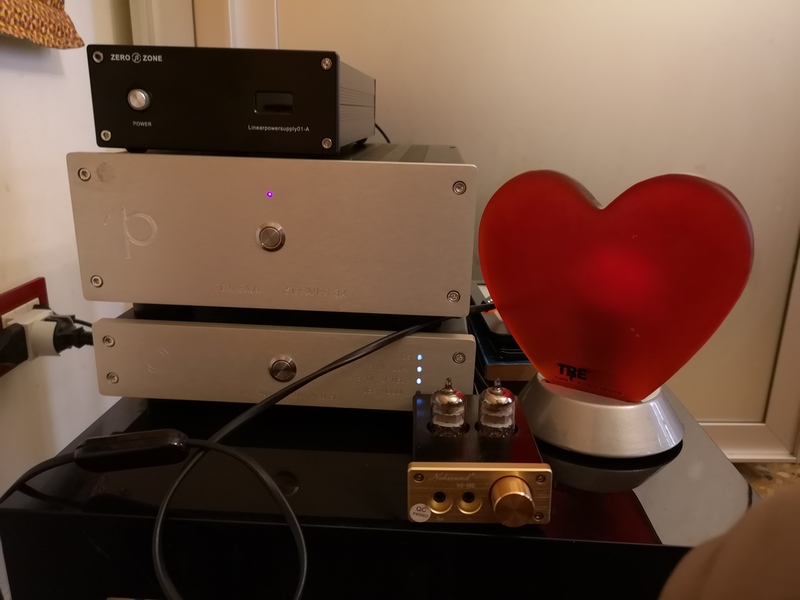 21/02/2019 Nice review from hifi-advice.com of PinkFaun streamer 2.16 Now with the last custom version of Audiolinux headless 2.2.0! 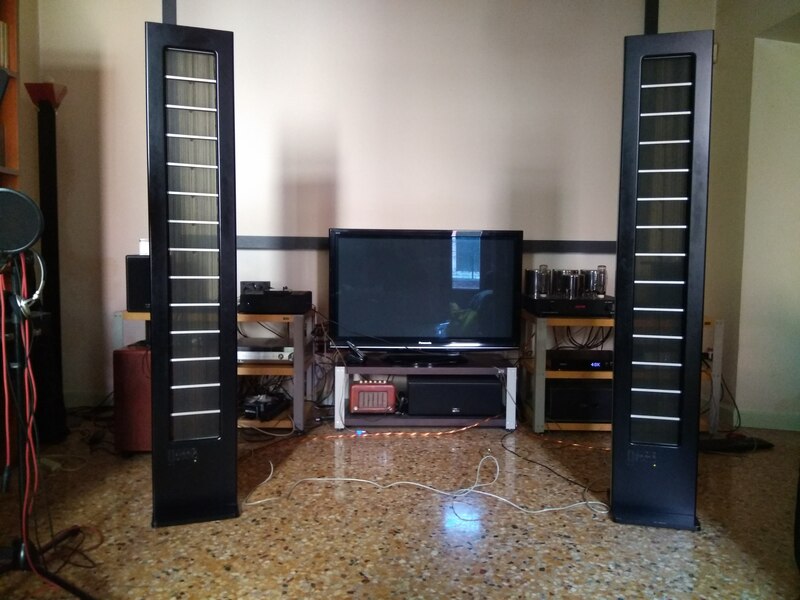 06/02/2019 Finally the ALSA RAVENNA/AES67 Driver and daemon is out! 20/01/2019 New menu version 090! Now there is the new option "Copy/Backup current installation to another drive"
The new installation will have different UUIDs and different computer name (audiolinux2), also Roon unique identity is changed. This way there will not be problems when running 2 audiolinux installations on the same Network. Be careful when you select destination drive. The destination will be wiped off! 14/01/2019 New menu version 087 will introduce the option "isolated CPU cores", You can divide CPU cores in 2 sets: one for system process one for audio applications. This is the first step toward a complete separation of audio process from all the other. Stay tuned! 30/12/2018 New Raspberry version 0.5 headless. Full menu with update options. 30/12/2018 Another menu version 086 with automatic bridge configuration! 29/12/2018 Menu version 085 with a fix for resize script. 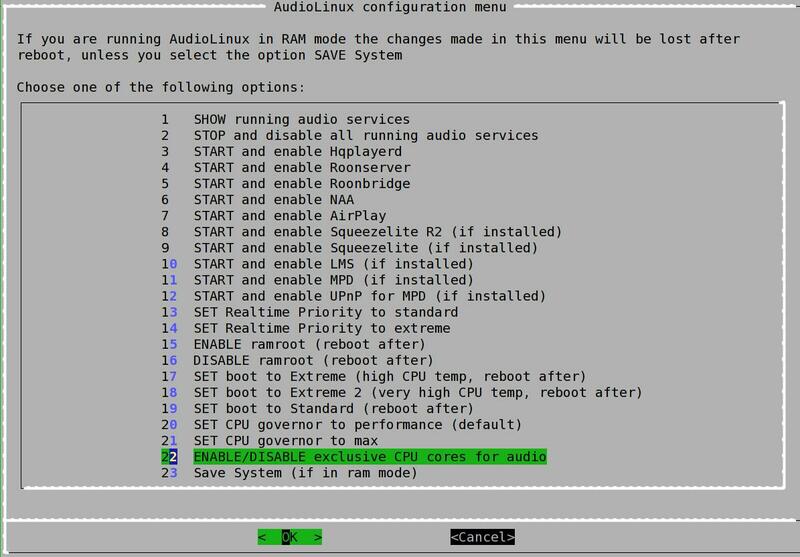 If you have installed audiolinux 0.7 or updated manually to the new menu you can install it from Update menu option. Now you can mount easier a local or network drive with a script . Mount scripts are in a beta stage, please use with care. 17/12/2018 Audiolinux 0.7 with new improved menu (now with 4 screens) and the possibility to update system, kernel and menu from inside. New web interface! Now you can connect remotely with a browser at the address http://ipaddress:8500 --> See menu images on the first column. 06/12/2018 New! 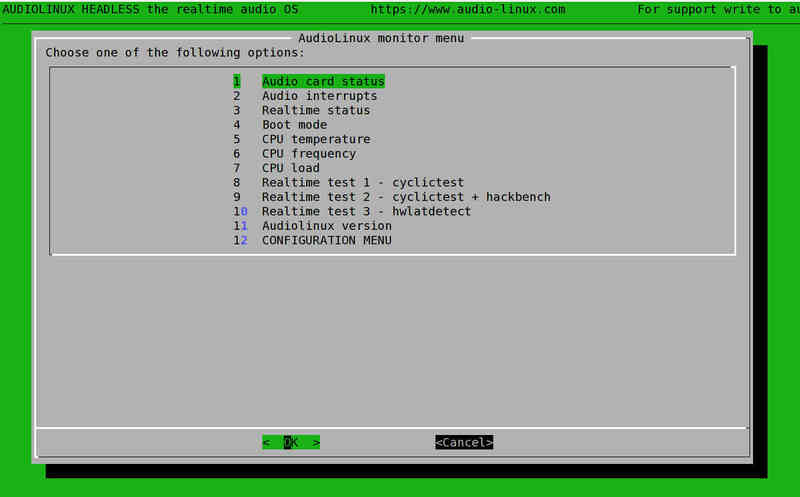 Audiolinux headless 0.6 with improved configuration menu and new monitor menu, new extreme boot option, various fixes and package update. 26/11/2018 Audiolinux 3.0 is out! Build on the same base as headless version, with the latest kernel 4.19.x BFQ has a very good latency performance. 2) Ram size is not enough for booting in ram mode. 18/11/2018 New buy options, see first column. 09/11/2018 New version 0.4 of Audiolinux headless with some little fixes, updated packages and new audio configuration menu. 09/11/2018 You can find a new Audiolinux guide, made by a user, here Probably I will make a section dedicated to user contributions. 31/10/2018 New "Understanding audiolinux 3 HOW TO CONFIGURE REALTIME PRIORITY"
27/10/2018 Today the site was transferred to a new faster server with SSL certificate. 27/09/2018 Audiolinux lxqt version 2.2.0 with new systemd bootloader that should fix problems with some bios. You don't need to update if your 2.1.0 is working fine. From now on only UEFI boot. 24/09/2018 Audiolinux lxqt version 2.1.0 with latest kernel 4.18.x linux-rt-bfq, all packages updated, reduced image size, more than 30 fixes or improvements. 22/09/2018 We have made some changes to the site. Not all sections are completed. 22/09/2018 Audiolinux headless version 0.2 Now ramroot is not enabled by default, see GUIDE. ù18/09/2018 New little Guide for audiolinux! You can see it on the left column or click Guide above. Available soon on .pdf format. 17/09/2018 New AUDIOLINUX HEADLESS is out! Completely rebuild system with systemd boot, systemd network, kernel realtime bfq 4.18.x, autostart to RAM, very low processor latency. Price 49 Euro (20 Euro for previous customers). 07/09/2018 Now out 2.0.3 with nvme ssd fix (upstream bug), new rtapp application with new realtime configuration (also last HQPlayer embedded installed and other updates/fixes). 29/08/2018 New version 2.0.2 is out with almost 400 packages updated and new kernel. 12/07/2018 Audiolinux 2x is out with new LXQt Desktop! /04/2018 AudioLinux version 1.9.7 is out! A lot of fix and update but the most important is the introduction of RAMROOT. Now you can load the entire filesystem to RAM at boot! 28/01/2018 New audiolinux version 1.9.6 with the last kernel and updated HQPlayer, Roon, etc. 13/01/2018 New realtime kernel 4.14.12_rt10 for download here. 21/12/2017 New realtime kernel 4.14.6_rt7 for download here. In the same directory you can find (under BFQ folder) also the new bfq kernel. 18/11/2017 New audiolinux version 1.9.5 is out! 07/09/2017 You can download patched kernel 4.11.12-2-rt13-rt here Performance is nice: processor latency max 11us, but most of time between 1-3us in our testing system! 07/09/2017 AudioLinux version 1.9.4 is out! 4.9.33-rt23-2-rt. HQPlayer embedded updated to version 4.0 beta 3. Now is possible to configure it from a browser. 4.9.20_rt16-3. 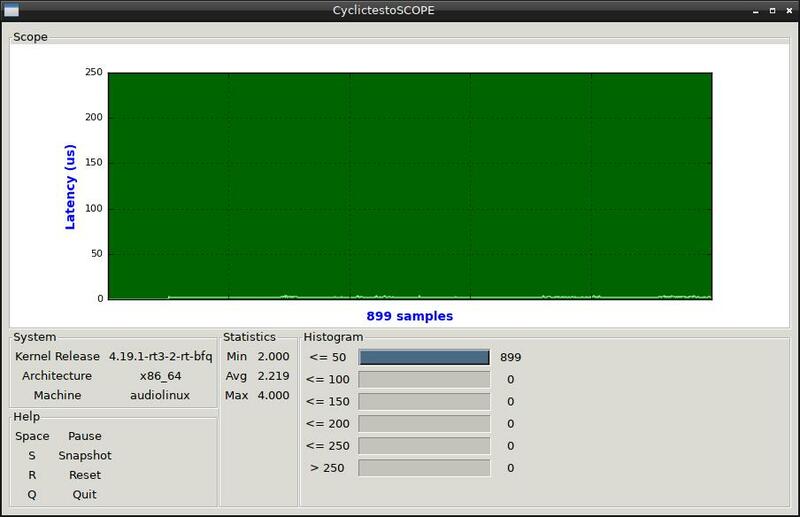 Realtime DSD upsampling with LMS now possible with sox-dsd. As always, almost 300 packages updated and various fixes. 01/04/2017 We will publish soon a series of little HowTo about configuring AudioLinux under the name Understanding AudioLinux. The first will be about audio and processor performance. Stay tuned!